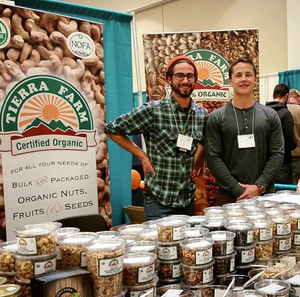 Tierra Farm is a Certified Organic manufacturer and distributor of nuts and dried fruits, located 20 miles south of Albany, New York. Tierra Farm started as a diversified organic vegetable farm in the Finger Lakes region of New York. The organic nuts & dried fruit portion of the business started in 1999, as a way to generate income in the slower winter months. One of Tierra Farm's core values has been to cultivate strong relationships with the best organic farmers in the world. Every year they purchase an increasing amount of nuts, seeds and dried fruit directly from the farms, some of which they have worked with for over a decade. Their level of knowledge and communication with their farmers allows them to preserve organic integrity and ensure fair business practices throughout the supply chain. Tierra Farm handles only Certified Organic products which are grown without synthetic pesticides, genetically modified organisms, or chemical fertilizers. This helps sustain biodiversity, conserves fresh water, and enhances the soil. They generate over 70% of their electricity from solar panels and recycle over 60% of their waste. Their boxes are made from recycled cardboard.